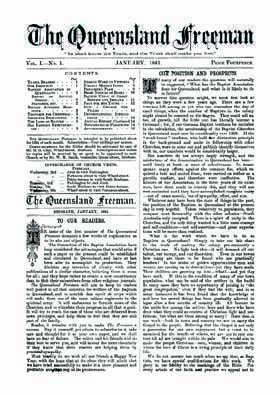 The Queensland Freeman was the monthly journal of the Baptist association in Queensland. It was first published in January 1881, and continued through until November 1888. Its chief aim was to unite the Baptist community in Queensland; to strengthen, encourage and inform its members concerning church activities, and to spread the Word throughout the whole of Queensland. The journal is particularly interesting for historians, as it contains information on Baptist and secular events throughout Queensland, plus records of baptisms, information on ministers, mission reports, notices of meetings, and many other fascinating snippets of information. It's a great genealogy tool for anyone using religious records to explore family history or build their family tree.